Schrager mock draft 2.0: Broncos to land Dwayne Haskins? Ed Oliver rising? 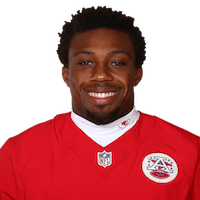 Published: Jan. 19, 2017 at 10:50 a.m.
Kansas City Chiefs defensive back Eric Berry picks off Pittsburgh Steelers quarterback Ben Roethlisberger in end zone. Published: Dec. 8, 2016 at 02:50 p.m.
Kansas City Chiefs safety Eric Berry intercepts Atlanta Falcons quarterback Matt Ryan and returns it for a touchdown. Published: Nov. 13, 2016 at 03:36 p.m.
Kansas City Chiefs defensive back Eric Berry intercepts Carolina Panthers QB Cam Newton and takes it back to the house for a touchdown. Published: Oct. 23, 2016 at 01:47 p.m.
Kansas City Chiefs safety Eric Berry tips Drew Brees' pass, safety Daniel Sorensen picks it off and runs it back for a touchdown.